As cosmetic surgery gains awareness and popularity, it’s no longer the sole privilege of the rich and famous. Now the average person can afford it too. These are the most affordable cosmetic surgery procedures out there. As cosmetic surgery gains awareness and popularity, it’s no longer the sole privilege of the rich and famous. Now the average person can afford it too. There are more opportunities for the everyday person to get cosmetic procedures, but procedure prices can still vary wildly. When a patient is seeking to change their appearance, there are two types of cosmetic procedures available to them: invasive and non-invasive. Invasive surgical procedures have a higher initial price tag, but that’s not the whole story according to Beverly Hills plastic surgeon Walt Sweeney, MD. “In general” he says, “the cost of non-invasive procedures can be very misleading. I have seen patients that have spent $6,000- $10,000 on filler in the span of several months, only to realize that the results would not replace those of a facelift”. “If someone is unable to embrace invasive treatment either psychologically or because their health will not allow it,” Dr. Sweeney continues, “then non-invasive treatments are a great option. However, if a patient is looking for a meaningful change, then non-invasive procedures may leave them wanting more from a monetary and results perspective." The Federal Reserve Economic Data (FRED) report on the real median income in 2017 shows that the average US household earns $61,372 a year, and According to the American Society of Plastic Surgeons, all the most popular procedures (which include breast augmentation, liposuction, rhinoplasty, and tummy tucks) all have an average cost of over $3,000. This means that the cost of many surgical procedures would account for over 5% of the average American's annual income and might not be affordable for most people. However, there are still some options available to even those on limited budgets. “Aesthetic surgery has become more affordable in the last decade," says Dr. Sweeney. "This is secondary to multiple factors, including provider competition, broader public appeal, and the impact of social media. People see celebrities, musicians, models, and social medial personalities being so open about cosmetic procedures." Now people not only look for board-certified providers while researching, but also to look for price deals. "This incentivizes aesthetic providers to give deals in the hopes of attracting these people," he says. As a result, it’s now much easier to find providers offering invasive procedures at a more affordable price. Here are some of the most affordable surgical procedures, which typically cost less than $3,000, accounting for the procedure price, surgeon’s fee and any related costs. The most expensive type of breast surgery involves silicone implants, but other types of work are considerably cheaper. Breast surgery under $3,000 includes breast lifts and reconstructive surgery to fix previously botched breast augmentations. Breast lifts have risen in popularity over the past decade. The aim of a breast lift is to improve the shape and appearance of the breasts in a natural way, rather than making them bigger using implants. According to the American Society of Plastic Surgeons (ASPS), a breast lift, or mastopexy, can have instant results and the healing process takes only a few weeks with one week of minimal discomfort (compared with up to a month with traditional implants). If you’ve had a previous breast implant procedure that you’re no longer happy with, plastic surgeons can address that too. If you want your breast implants to be removed, this will set you back approximately $2,400 - over a grand cheaper than having them put in. 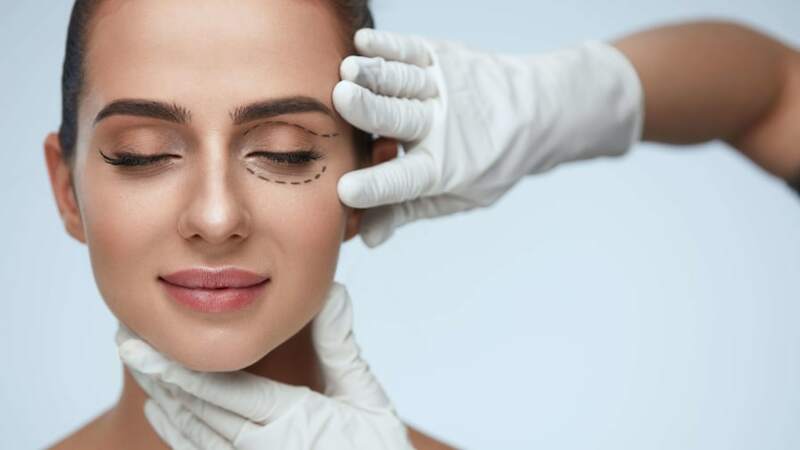 Eyelid surgery, or blepharoplasty, is especially popular among those hoping to address signs of aging and is one of the most affordable types of invasive plastic surgery available on the market today. The treatment plan varies from patient to patient, but generally the aim is to lift and rejuvenate eyelid skin and reduce the appearance of fine lines and wrinkles. Eyelid surgery can be performed on the top or bottom eyelid or both at the same time. It involves removing deposits which cause the eyes to appear aged, including bags under the eyes, and sagging skin on the upper lid. The healing process is fairly straightforward. Most patients will be fully healed within two weeks, especially if they follow their post-surgery plan exactly. Eyelid surgery can also be done at the same time as other similar procedures such as the brow lift. According to the ASPS, blepharoplasty costs an average of $3,026, making it one of the most affordable procedures available on the market today. Another popular (and affordable) cosmetic procedure is lip implants, which are used to create fuller, more traditionally-feminine lips. Lip implants cost $2,500 on average and the process involves making small incisions in the corners of the mouth into which the surgeon inserts implants made from silicone, saline, or the patient’s own tissue. Patients will experience a little tenderness and swelling post-surgery, but the recovery period is quite short (usually 2-3 weeks). The advantage of lip implants over comparable lip enhancement treatments, such as dermal fillers and other injectable chemicals like hyaluronic acid, is that they are designed to maintain results for longer and provide lasting effects for the patient. What Should You Do If You Can’t Afford Cosmetic Surgery? Frustratingly, health insurance does not typically cover elective cosmetic surgery treatments and taking out a loan in order to get a procedure can add more stress and anxiety to the recovery process. If you’re desperate for cosmetic enhancement, but worried about the surgery cost, Dr. Sweeney has some words of advice. “If you have found a cosmetic surgeon that you believe shares your vision and is dedicated to your results, recovery, and happiness, then saving up may be the best option," he says. Explore your options, compare different practices to ensure you’re getting the best deal for you, and utilize the American Society of Plastic Surgeons website to find honest, consolidated information on what to expect from each procedure.